MICRO’10 and HPCA’11 GPU tutorials. Rich and collaborator in computer architecture, Hyesoon Kim, gave two tutorials on performance analysis and tuning for GPGPU platforms at two of the big computer architecture conferences, MICRO 2010 (December, in ATL) and HPCA 2011 (February, in San Antonio). Slides from MICRO 2010 tutorial are available, but stay tuned for the HPCA slides, which update that material for clarity and brevity. 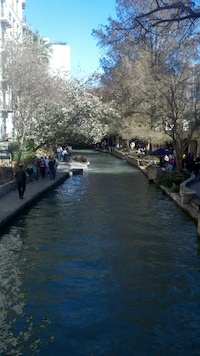 And here’s a snap from the beautiful Riverwalk area of San Antonio. During the first week in August, we helped organize a GPU tutorial for the annual TeraGrid conference, held this year in Pittsburgh. Many thanks to Hyesoon Kim (GT), Brandon Hill (Purdue), Bruce Loftis (UT/NICS), and Tabitha Samuel (UT/NICS) for putting it together.